The Red Raiders scored 21 points to place 5th out of 50 teams at the Wisconsin Track Coaches Association Indoor State Meet at UW-Whitewater. Maxwell Radcliffe turned in the highest finish of the day with a second place finish in the 800m run in 1:59.38. This is Radcliffe’s indoor best and first time under 2:00 indoors. 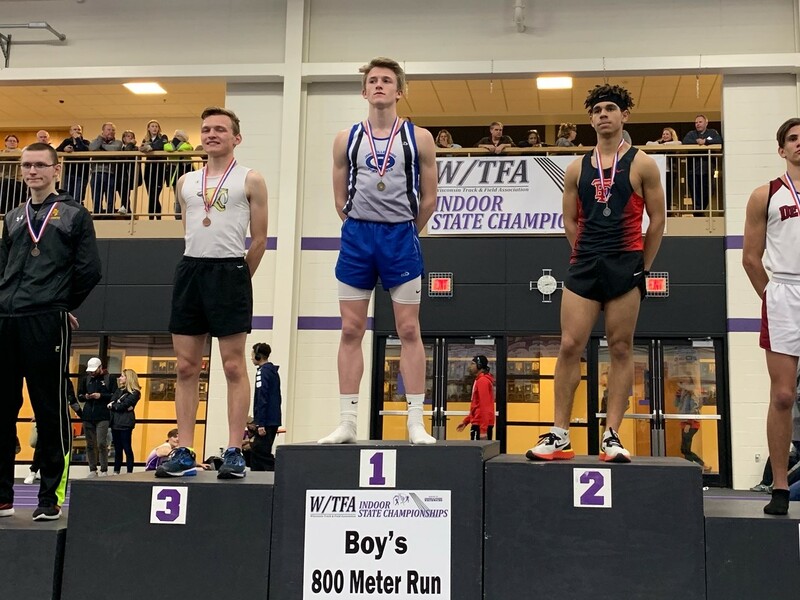 Henry Wellenstein placed 3rd in the 1600m run with a PR 4:27.80, Chase Roberts placed 6th in the 400m dash in an indoor best 51.86 seconds, Nile Bridges placed 7th in the 400m dash in an indoor best 52.37 seconds, and Michael Pridgeon placed 7th in the shot put and PR’d twice in the process with a 51′ 2″ throw before getting his best mark of 51 feet 7.25 inches. In the high jump Gabe Sampson and Elijah Brittingham tied their PRs with 6 feet and 5 feet 10 inches respectively. Nate Blischke ran an impressive 9 second PR in the 1600m run (4:32.41) and just missed scoring by less than 1 second. Grant Heus also turned in a PR of 4:43.44 in the 1600m run. Max Finco ran an indoor best 2:03.37 in the 800m run, Caleb Anderson ran a PR 53.62 in the 400m dash, Lewis Huenink ran 6.74 in the 55m dash prelims and 6.71 in the semifinal round, but did not advance to the final. The boys turned in many great performances including some solid splits in the two relays but the team had dropped baton and an injury that prevented either relay from scoring. The team is now focused on getting healthy and regrouping for the outdoor season.